My sister will now be the book reviewer on this blog. The following is her latest review. Please note: the publisher Sophia Institute Press is offering a 25% discount to readers of this blog. When I began homeschooling, I was determined to teach my daughters to love the Catholic Church, to love living the Liturgical Year, to enjoy participating in the life of the Church. I used an actual Catholic calendar, looked up the feasts, holy days, seasons and prepared my lessons accordingly. 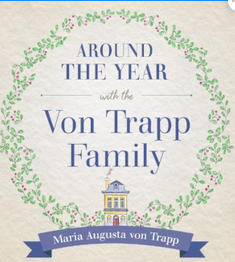 How I wish I had had this book by Maria Augusta von Trapp! Maria, you may well know is the Maria of the Sound of Music fame. As a former postulant in an Abbey, she must have had a deep love and knowledge of the Catholic Church and a devotion to all the beautiful traditions of the Austrian people. As she writes in her introduction, when her family was "transplanted" to America, those long held traditions served to firmly root her family in America by helping them to live the life of the Church as they had when they were in Austria. This lovely book will also help you live the Liturgical Year with your own family in much the same way she did. She provides lovely stories of each season of the year, the preparations they made, the foods they cooked, and especially the music they sang. Each season is explained and carefully broken down so that your preparation can follow very simply by putting into practice her customs and traditions. Beginning with Advent and ending with All Souls Day, Maria takes us through the Liturgical year and ends the book with an entire chapter on celebrating feasts, such as birthdays and baptismal days. This beautiful book is a reprint of the 1955 edition. It is simply a treasure. I highly recommend it as a most useful and inspiring addition to any Catholic home library. After five years of marriage, Gulzar Masih and his wife, a Catholic couple, adopted a baby girl from a local hospital with the help of a family friend. The girl was named Meerab. 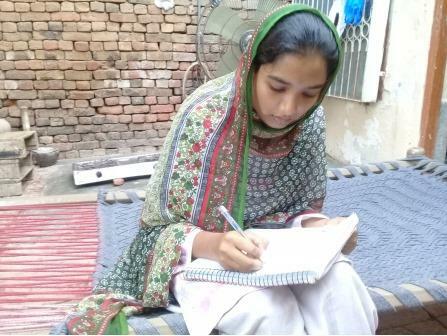 Living in Sargodha, Pakistan, Meerab, who is 19 today, talks of the difficult realities of her life and her goals for the future. “After my father’s passing, my mother, though experiencing great sorrow and pain, found work as a maid to meet our domestic and educational needs. Family income was low and expenditures were high, which eventually led to the discontinuation of my studies. But my mother encouraged me not to lose my faith in God, saying He would show us the way. “All night, I would think about my father and our family’s needs. So I decided to help my mother, whose health was not strong. She is often sick and has high blood pressure. “When I was in the eighth class, the St. Vincent DePaul Society, run by the diocese, began to help with costs. The initial monthly stipend was 500 rupees, and after two years, it increased to 1000 [approx. $7.50]. Later on, I was admitted to the local High School, which is operated by a Catholic organization and is one of the best schools in our city. I am thankful to our principal, who waived all fees so I could continue my education without disturbance. “Because of the good people God sent to us, I am able to participate in a pre-medical program at a college. I face religious discrimination there, as the school is Muslim, but I know that God is with me. The following is a quote by Pope Pius XI and found in the self-retreat book I Believe in Love by Father Jean C. J. d'Elbee. Published by Sophia Institute Press. Your bishop and the Pope are the golden chain which connects you to the Divine Redeemer. You must be with the Pope, because whoever is with him is with the very foundation of the Church; for it is against him, and the Church founded on him, that the gates of Hell shall not prevail." If you recite the Veni Creator Spiritus. Thanks to Janette at Truth Himself for sharing. This hymn was probably written by Rabanus Maurus (856), Archbishop of Mainz. In addition to its place in the Pentecost liturgy, the Veni Creator has also been assigned as the official opening prayer for Church councils and synods. It is recited and sung by the faithful all over the world at the start of important undertakings, such as the beginning of a school year, at conventions, missions, retreats, and on many similar occasions. A partial indulgence is granted to the faithful who recite it. A plenary indulgence is granted if it is recited or sung on January 1st or on the feast of Pentecost.